Keito Myose (Yuya Yagira) and Yuichi Saeki (Masato Yano) were involved in a horrible case when they were young. They are now all grown up, but still suffering from that incident. At night, Keito and Yuichi meet again. A woman who is an acquaintance of Keito is killed in Keito's room. While the police investigates, a detective tells him "... you know Yuichi Saeki is a suspect and is on the country's most wanted list..."
Based on novel "Saigo no Inochi" by Fuminori Nakamura (published 2007 by Kodansha Ltd.). 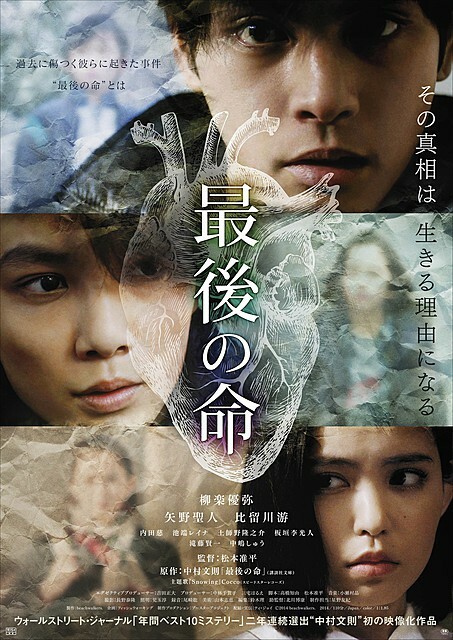 "Saigo no Inochi" is the first movie adaptation of a Fuminori Nakamura novel.